Volunteer with Kaya in the home of the Limpopo National Park, the Zambezi river and a 2500km tropical coastline. Explore this increasingly popular destination for ecotourists and nature lovers. In Mozambique, our Marine Research and Whale Shark Conservation project works toward conservation of the country’s coral reefs and the marine life that rely on them as a habitat. Volunteers monitor the condition of the reefs and the wellbeing of the animals that live there. Anyone interested in marine biology or scuba diving will enjoy contributing to protect this amazing ecosystem. Intern and volunteer in Mozambique projects will be based in Tofo, a small and relaxed coastal town. You’ll be able to explore the Indian Ocean by taking surf lessons or renting kayaks. Get caught up in the tranquil lifestyle of the town by mingling with locals in the markets and cafes. Be sure to try pão (a Portuguese bread roll baked in wood-fired ovens), peri peri chicken and the wide range of fresh fish on offer. 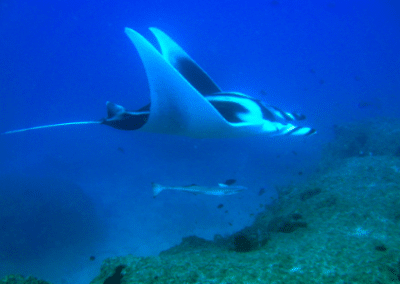 Tofo boasts an astonishingly complex marine ecosystem, which you can enjoy through diving in the Manta Reef. You’re also well located to travel to one of Mozambique’s famed diving sites- Kingfisher Reef in Inhambane. Don’t miss the opportunity to go on a safari through Limpopo National Park. This unique reserve is a transfrontier park that links with Kruger National Park in South Africa and Gonarezhou National Park in Zimbabwe. It covers an area of over a million hectares and is home to lions, elephants, rhino, hippos and giraffes. Help conserve Mozambique’s extraordinary ecosystems while living in a tranquil, coastal town.